High In The Andes, Bolivia's Gondolas In The Sky Ease Congestion : Parallels One of Latin America's poorest countries is building the world's longest urban cable car system. The aim is to transform the lives of commuters who battle chronic traffic problems. La Paz is a tough city for mass transit. It was built by Spanish conquistadors, who laid out narrow, winding streets, and sits in a bowl-like depression with neighborhoods rising up the craggy slopes of the Andes Mountains. The landscape is too steep for a subway. So the Bolivian capital relies on 40,000 minibuses. These can handle the hills, but there aren't enough of them. What's more, the minibuses have made the city's traffic jams even worse. So like other mountainous South American cities — Medellín, Colombia; Caracas, Venezuela; and Rio de Janeiro — La Paz is building a cable car system. The first line, connecting La Paz to the mountaintop city of El Alto, began operating in May. The Swiss-made gondolas have polished wood benches and broad, tinted windows. Unlike exhaust-belching buses, they run on electricity and make hardly any noise. The trip costs about 40 cents and takes 10 minutes — compared with 35 cents and a half-hour by minibus. 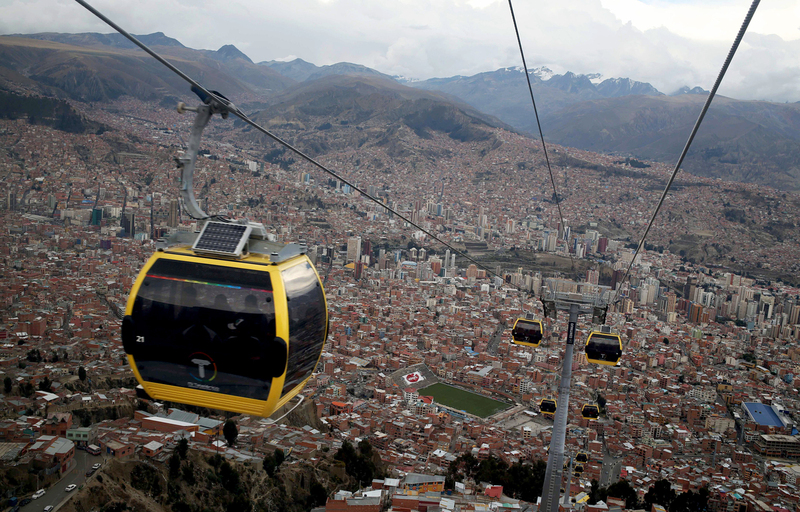 Passengers ride a cable car that links downtown La Paz with El Alto, Bolivia, in September. The trip costs about 40 cents and takes 10 minutes — compared with 35 cents and a half-hour by minibus. Sandra Gutierrez, a La Paz homemaker, says the gondolas are safer than minibuses, which are often jammed with passengers and pickpockets. Besides commuters, tourists are clambering aboard. 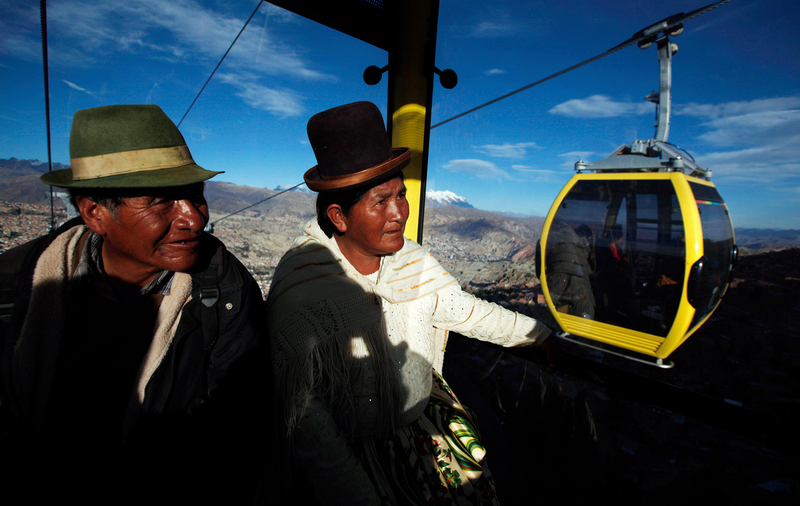 Approaching El Alto, nearly 14,000 feet high, the gondolas provide a spectacular panorama of five snowcapped Andean peaks. Cesar Dockweiler, the system's general manager, says that with eight lines planned by 2019, this will become the largest mass transit cable car system in the world. A second line was recently inaugurated, with marching bands, folk dancers and an appearance by President Evo Morales, who was re-elected by a landslide earlier this month. Bolivia is one of the poorest nations in Latin America. But thanks to rising natural gas exports, the economy is booming. Morales is spending some of the windfall on the gondolas and other major public works projects in an effort to change the country's image. "We should never again feel like a small country or that we are underdeveloped," Morales told the crowd at the ribbon-cutting ceremony. "We need optimism. We need to look onward and upward." The cable cars seem to be helping, at least to people like Rubén Fernández. "This means so much," the college student says. "Just a few years ago, no one believed a project like this would be possible."